Fr. 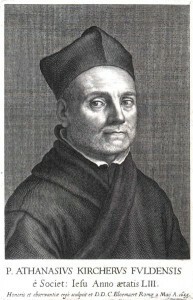 Athanasius Kircher (1602-1680) was a German Jesuit scholar and a professor of ethics and mathematics at the University of Würzburg. In his day he was considered one of the greatest authorities in Europe on Chinese and Egyptian cultures, archaeology, ancient languages and astronomy. However, he was not without his detractors, one of whom was Decartes who robustly attacked Kircher’s scientific abilities. Kircher’s writings filled 44 folio volumes. Kircher claimed to have deciphered the ancient Egyptian hieroglyphics, but this was later shown to be totally unfounded and drew highly critical comment such as that of the Egyptologist Sir E. A. Wallis Budge who wrote in 1910: Many writers pretended to have found the key to the hieroglyphics, and many more professed, with a shameless impudence which is hard to understand in these days, to translate the contents of the texts into a modern tongue. Foremost among such pretenders must be mentioned Athanasius Kircher, who, in the 17th century, declared that he had found the key to the hieroglyphic inscriptions; the translations which he prints in his Oedipus Aegyptiacus are utter nonsense, but as they were put forth in a learned tongue many people at the time believed they were correct. A more recent critique is available online(b). When it is realised that more than a century was to pass after Kircher’s death before the Rosetta Stone was discovered and the work of Champollion finally gave us a reliable decipherment of Egyptian hieroglyphics, it is quite reasonable to treat Kircher’s translation as purely speculative. In recent times Kircher has regained widespread fame because of the map, published in his Mundus Subterraneus , which among a range of subjects(c), outlines Atlantis (Insula Atlantis) between Africa and America. This Latin text can now be read or downloaded online(a). In this book he was the first to propose that the Canaries and the Azores were the mountain peaks of sunken Atlantis. His famous map has north shown at the bottom with Africa and Spain on the left and America on the right. There is no particular significance in this fact as the convention of having North at the top of maps is a relatively recent and generally attributed to the controversial 8th century Irish cleric, Virgil of Salzburg, who was eventually appointed bishop of that city and later canonised as St. Virgilius. A Latin label on the map reads: “site of Atlantis, now beneath the sea, according to the beliefs of the Egyptians and the description of Plato. A chart based on beliefs and descriptios clearly shows that his offering is speculative and not a real map, although some claim that it is an ‘authentic’ depiction of Atlantis, such as can be seen on an hour-long YouTube video from a 1997 conference(g). It was Kircher’s map that prompted Rand and Rose Flem-Ath to begin their extensive investigation of ancient maps, which led to the publication of When the Sky Fell, outlining their evidence for Atlantis being located in Antarctica. Recently, Doug Fisher has drawn attention to the similarities between a 1592 map of South America by Abraham Ortelius and Kircher’s Atlantis map when inverted(e). Some further background information on Kircher’s map is to be found online(f). Dale Drinnon has offered an example of Saharan rock art as a possible ‘prehistoric prototype’ of Kircher’s map(d). In 2004 a book with the enticing title of Athanasius Kircher: The Last Man Who Knew Everything was published. It was edited by Paula Findlen and includes essays by leading historians of our day.